National developer Cbus Property has unveiled its vision for Melbourne’s largest integrated luxury precinct, believed to be the most significant architectural statement in Melbourne since the creation of Federation Square. The precinct, Collins Arch, is set to put Melbourne on the world stage with its striking design and carefully considered approach to urban renewal and integration. The $1 billion development will transform an entire 6000 square metre city block into the city’s first true mixed-use precinct to feature luxury apartments, a five star hotel, WELL-rated offices, retail and 2000 square metres of public open space including a tiered amphitheatre. Cbus Property CEO Adrian Pozzo said Collins Arch will be a vertical village within the city that will transform our skyline. "A flourishing destination drawing people from across the city, Collins Arch will be a place for thousands to live, work, play and stay,” he said. “A city gets very few chances to innovate and change its urban fabric, but this is one. Collins Arch will energise Melbourne, strengthening the connection between the east and west areas of the CBD, and be a part of our city for all of us to be proud. Designed collaboratively by architecture and design practice Woods Bagot and New York firm SHoP Architects, Collins Arch’s unique design features two towers linked by a sky bridge spanning 14 metres. At the heart of Collins Arch is an urban destination that creates a new hub for dining and relaxing. It brings SHoP, named the Most Innovative Architectural Firm in the World by Fast Company in 2014, down under for the first time along with its pedigree in 24-hour mixed-use developments. 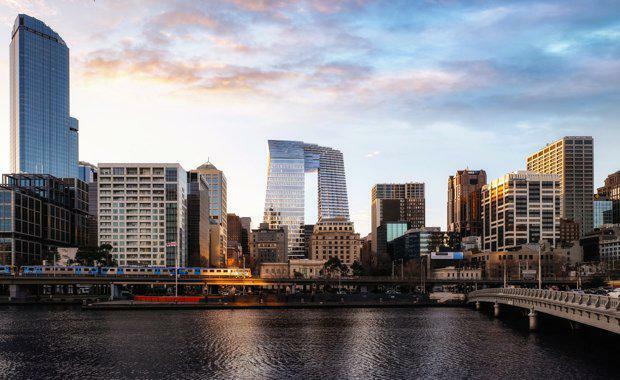 SHoP Architects Principal William Sharples said Collins Arch would play a critical role in reconnecting the Melbourne CBD to the Yarra River and Southbank. “Using what we’ve learned from work in cities around the world, SHoP is confident Collins Arch and the public environments it creates will contribute to add to Melbourne’s bustling street life and laneway culture," Mr Sharples saidCbus Property has appointed Multiplex to commence early works in September 2016. The total build of the interconnected dual towers will take approximately three years, with completion anticipated in late 2019. The development’s 202 luxury apartments, of which 33 per cent feature large tiered terraces overlooking the Yarra River, will launch later this month and showcase the first genuine fusion of New York and Melbourne style in their interior design and layout. These apartments will include a range of penthouses as well as a sky garden, residential amenities and pool experience designed to rival the best that New York has to offer. Already 30 per cent of the 49,000 square metre WELL-rated office space has been snapped up by some of the world’s leading companies including global law firm King & Wood Mallesons, which was the first tenant, taking 8,300 square metres in the office component. After receiving more than one dozen expressions of interest from international investors and hotel operators, Cbus Property is in final negotiations with an international investor and hotel operator for the 5 star luxury hotel. This successful bidder will operate 294 hotel rooms in the development and be announced later this year.